The common question we get is whether it is cheaper to hire an agency or a consultant, and for a long time the answer has been “it depends”. This is still true, as it depends on the service you need, the firm’s years of experience and specialty, how full they are with work, and so on. 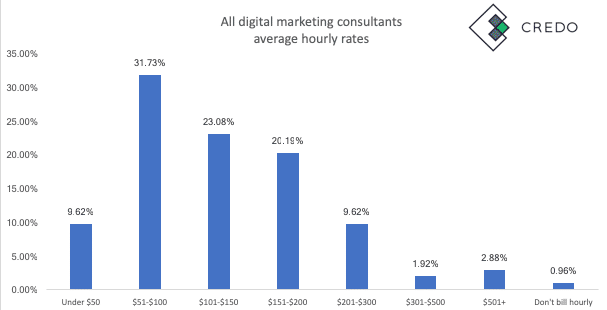 But in the interest of answering the question “how much do digital marketing consultants charge?”, we took a stab at it with our data from the 2019 digital marketing pricing survey. The survey had 104 solo consultant respondents worldwide, with 55 in the US and the rest spread around the world. When we normalize the data using the middle number of each range, we can find the average hourly rates for digital marketing consultants. 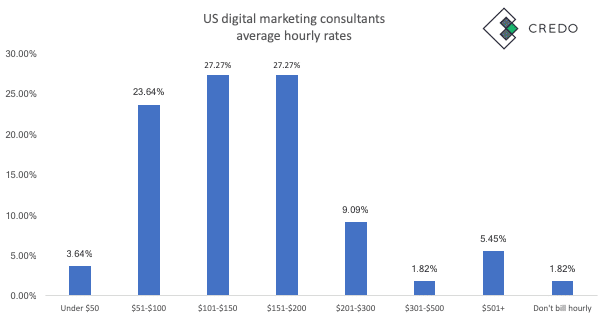 The average hourly rate for US-only digital marketing consultants is $161.57. 18.18% of US consultants in our dataset charge over $200 per hour and 2.88% charge more than $500 per hour. 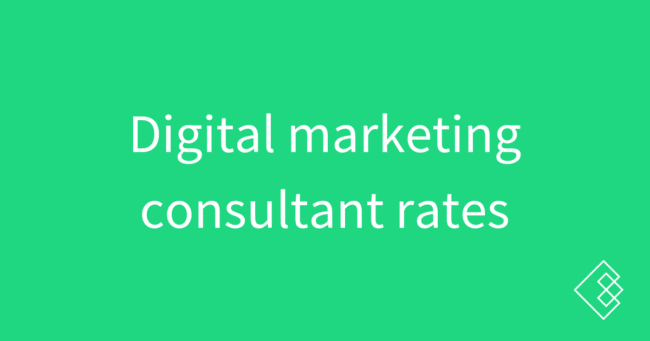 Let’s look at the digital marketing consultant hourly rates, shall we? Not surprisingly, the more senior someone gets the more they tend to charge. Most consultants with 10+ years of experience are charging more than $100, though there are a set charging $51-100 per hour. Interestingly, 4 of the 12 are US-based! Basically, the spread widens as consultants get more experience. There are not any consultants with less than 3 years of experience from our dataset charging more than $150/hr. There is a subset of consultants with 5-10 years of experience charging $200-$300 per hour. Only consultants with more than 10 years of experience dare to charge more than $300/hr, and 9.09% of them dare to do so. 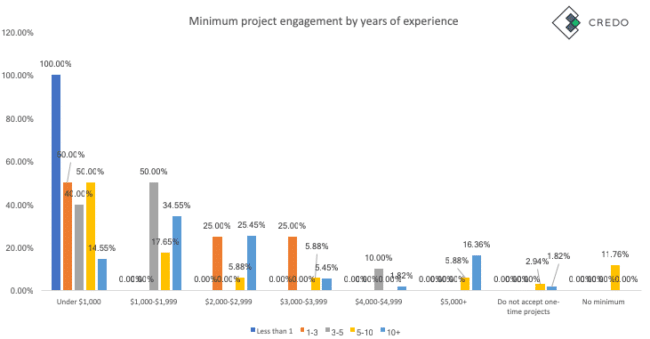 Now let’s look at digital marketing consultant project minimums. 10.58% don’t take one-time projects that are less than $5,000. Let’s look quickly at how the above numbers break down as we get more granular on years of experience, keeping in mind that as the data gets more granular then the numbers break down a bit and are to be taken with grains of salt. 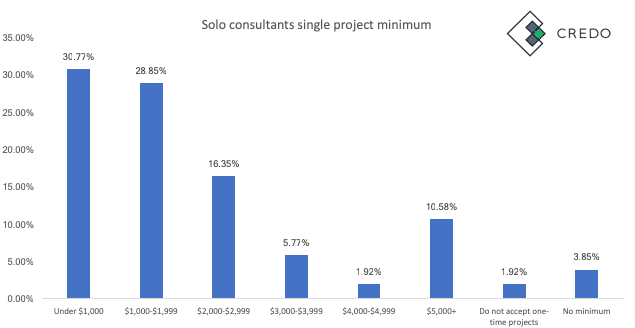 Most consultants in our dataset cluster around the Under $1,000 minimum project size. The next biggest bucket is $1,000-2,000 and then the number get very spotty.